3 The museum’s bus or ferry has a flat rate of $20 per person for a return ticket. You can take the ferry both ways, or the bus both ways, or bus one way and ferry the other. 4 Booked online through their website, after checking in various booking sites since the rates are the same anyway. This is a serviced apartment with a full kitchen. We booked for a room that can fit three people, but got upgraded to a suite than can fit five. 5 First meal in Hobart. This includes three soups, a platter of oysters, and a seafood basket. 7 We bought food to cook, like lamb chops, pasta, salad greens, cheese, bread, fruits, dessert, etc. This is too expensive for a 3-day trip to Hobart. The expenses can be severely cut if you take an AirBnB accommodation few miles from the city, for example. 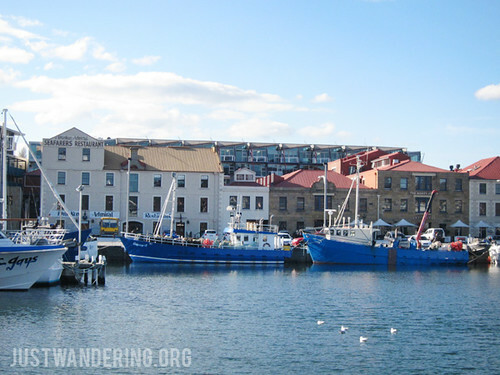 When I was in Hobart for 1 week, I booked an entire apartment for AUD45 a day in a superb location near Mt. Wellington which is Tassie’s highest peak. Transport can also be cut substantially. You can take a shuttle when moving from airport to CBD and on the way back (just book ahead for a guaranteed seat). Also, use the bus instead of taking the cab. You can even travel to MONA by bus; of course, MONA ROMA is an experience in itself. You’re right Bill, it can be so much cheaper. However, we prefer the central location and the relative ease of hopping on a cab. Thanks for sharing your advice though!